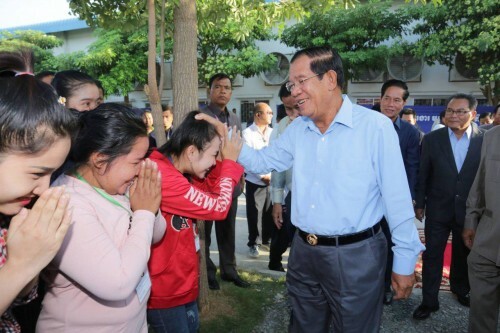 Hun Sen, Strongman of Cambodia, announced Wednesday that the Royal Government of Cambodia reserved US$10 million to fund pregnant workers who are delivering babies, addressing to more than 6,700 workers in Kandal province. According to the government’s policy, each female worker who delivers one child receives 400,000 riels ($100), a twin receive 800,000 riels ($200), and triplet receive 1,200,000 riels ($300). “We urge all enterprises to check with National Social Security Fund so that workers will benefit from our policies,” said the premier. Back in 2018, workers had to pay 50% to Social Security Fund to get free healthcare, while the employers paid the remaining. In 2019, however, employers will pay 100% to Social Security Fund for every worker, resulting in the saving of two to three dollars per month for every worker. The premier’s policy aims to help workers gain more salary and pay less to support their livings. Prime Minister also highlighted the importance of workers’ employment record. “Everyone [worker] shall keep employment record carefully to benefit from pension. Supposed that you have been working for five years and that you transferred to a new place, your employment record will prove that you do not just work for the first day, but five years and one day,” he said.